When the snow cleared in the spring, I hit the trails knowing that I actually had a goal race in mind. Yes I signed up for a Sprint Tri in May, but I saw that as a decent starting point for my running plan for the year. My focus, my goal, for the year was the half marathon. I found a few different training plans that I followed, some weeks more successfully than others. I continued to get stronger, not worrying too much about speed, focusing instead on my form and over all running health. I suffered through some minor injuries, I tried new gear, I found new routes. I even ran on my vacation! I’ve only ever ran a half marathon once before, 5 years ago when I completed the 2012 Army Run Half. Some of my family absolutely refused to believe I actually ran that race. Their disbelief isn’t really a surprise. At that time I was not much of a runner. I didn’t have a training plan, and I certainly didn’t seem to have the skills needed to complete that distance. In fact I did complete the race, even making many of the normal mistakes new runners make, in a less than stunning 2:49. I was just about the last male runner to cross the line, but I did finish. At the time, I said I would NEVER run that far again. Of course famous last words being what they are, last year I got the urge to try the half at least one more time. 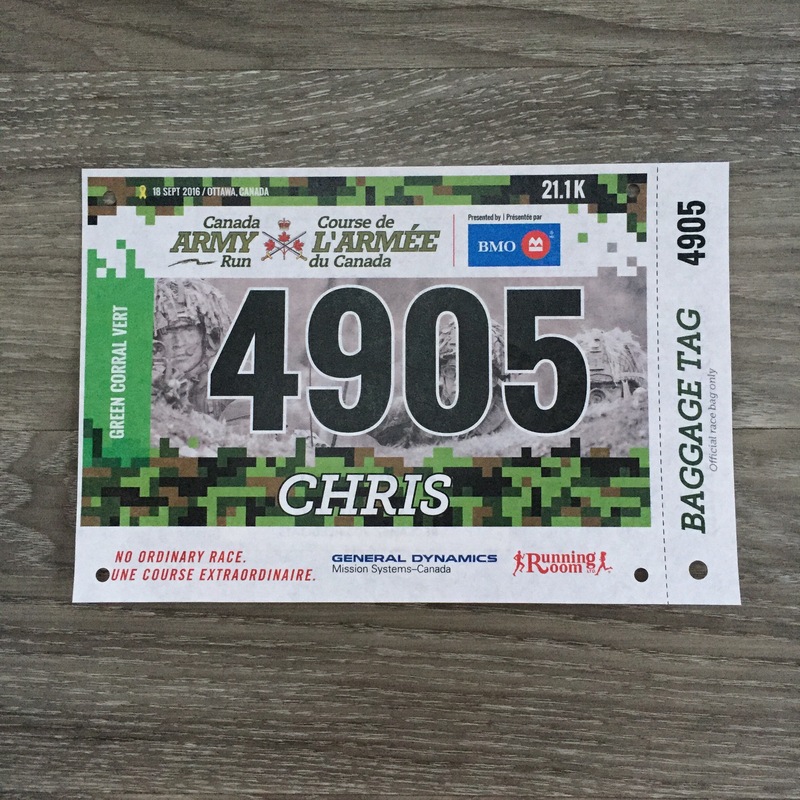 Fast forward to September 2016 when I was planning on returning to the Army Run Half. I was thinking that I this was a distance I could revisit as a more knowledgeable and more confidant runner. Part of me was thinking it would be great to accomplish this before I turn 50 — I’m 49 this year — and this being the 5th anniversary of my only other attempt at the Half seemed auspicious. Unfortunately I had to opt out of the race at the last minute. I even had my bib. But not running was the right choice. After choosing the DNS, I spent much of September and October in a running funk. I still ran, but it was a little aimless, and nothing long. 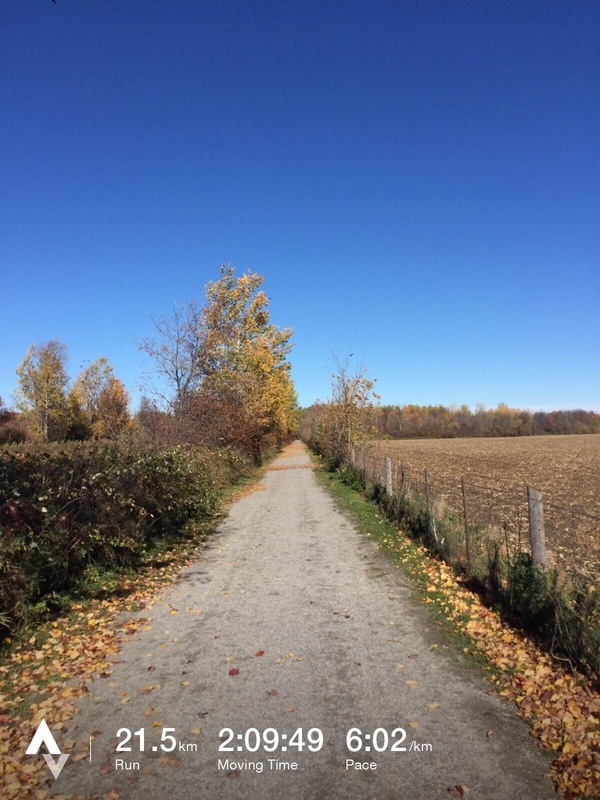 Last weekend, on a gorgeous October afternoon I hit the trails with the plan of hitting the magic 21.1 km mark. My original goal time for the race had been anything under 2:30, maybe 2:15 to 2:20 range, but I didn’t have any real expectation to go faster than that. Using the tried and true 10:1 ratio (thanks John Stanton! ), I started running along some new trails. It was a bit cooler than I had thought, a blustery 6C, but it was a sunny day. Fortunately, much of the route was tree lined trails so the wind wasn’t too bad. Of course since I am new to cooler temperature running, I had a hard time figuring out what to wear. Having settled on my Army Run Half shirt and an Under Armour running sweater on top and Lulu Surge shorts and Running Room Calf sleeves on the bottom, I was off. At first I regretted not having gloves, but once I got moving I was fine. In fact I almost regretted the double layer on top, but it was also fine. I even found time to take some pictures. It really was a gorgeous fall day. I kept a pretty steady but comfortable pace the entire way and I was really happy to finish in 2:09 with and average pace of 6:02/km. 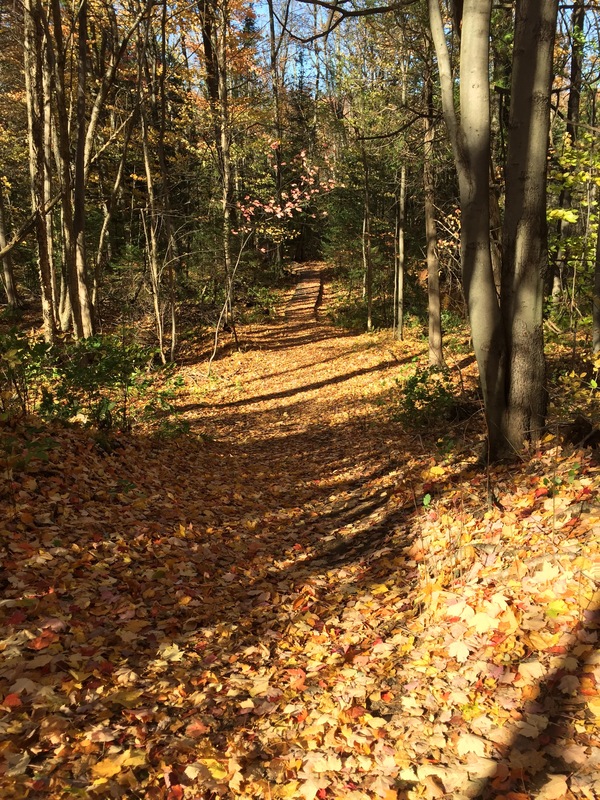 When I hit the trails, I wasn’t convinced I could actually run as far and as fast as I did. I had pretty much stopped training and running seriously, but clearly there was enough muscle memory left. And I’m glad I there was because my Distance Demon was Demolished! I knew I could run a Half Marathon distance, but now I know I can do it in a respectable time and without suffering for days afterwards. The Half and I still have some unfinished business, but this time there won’t be any Demons in my way.